​​In a class by ourselves, Going to the Chapel… , an independent wedding and event planning service, has a unique approach to wedding planning that follows military event planning protocol and etiquette, while blending individual visions and ideas to create the perfect wedding for you. We know how to beautifully take your wedding into the military mold, and still be your wedding. ​ The experience of Jan Wise, Principal of Going to the Chapel ... , as an educator reminds her that sometimes perfection is the only acceptable outcome: 99% isn’t a passing grade when you count students after a field trip, and “close enough” isn’t good enough in anything the military does. As the mother of Marine officer’s bride, she learned that you must respect budgets, as well as the bride’s dreams. As the mom she experienced the necessity of the wedding planner communicating promptly, accurately, and balancing sensitivity of her wishes with honest counsel. This is exactly what she does for each one of her brides, grooms and their families. She honors the traditions and practices of the Academy, and although not affiliated with the USNA, she works well with its staff and both “on the yard” and private service providers. 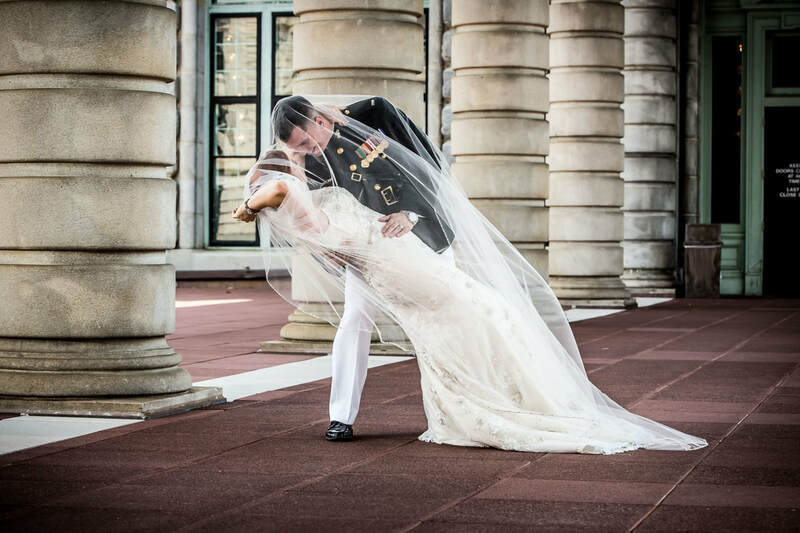 Organizational skills are her natural strength, but experience is the only teacher for the specialized service of facilitating Naval Academy weddings to perfection for all participants; bride, groom, families and guests. In Preparation for Your Wedding Day…. Please read more of our reviews on our wedding wire page! How is getting married at the Naval Academy Chapel different from other churches? ​Most churches only schedule one to two weddings a day; however the Naval Academy Chapel averages four to six weddings in a single day. Weddings are scheduled between 12:00 noon and 5:00 pm and, with the exception of a Nuptial Mass, are limited to 25 minutes. As soon as one wedding departs the Chapel steps, the next wedding enters the Chapel and begins seating their guests. Commissioning Week weddings are scheduled on the Friday and Saturday immediately following commissioning and graduation. How are the services provided by Going to the Chapel... different from a civilian Wedding Planner or Coordinator? Couples planning a Naval Academy wedding encounter a unique set of challenges specific to a military venue, often complicated by deployment or geographic separation. Jan has the access, knowledge and skill to address those challenges and offers services developed specifically for couples planning a destination military wedding. 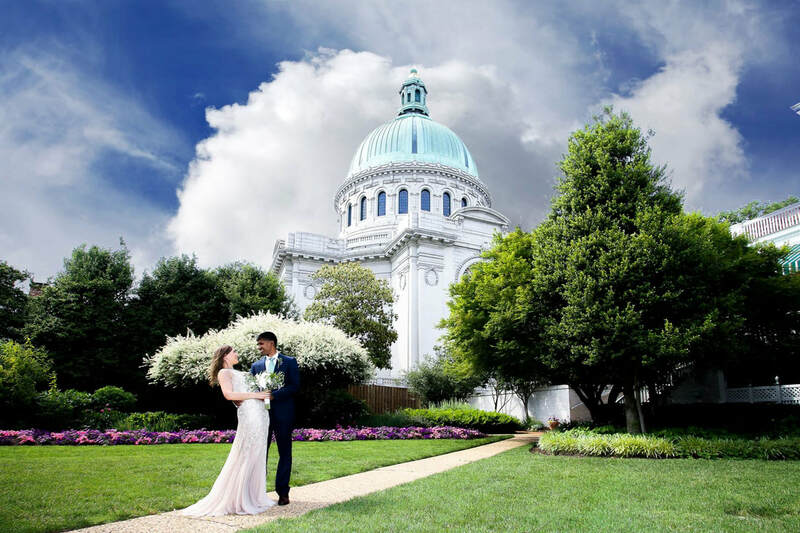 In person meetings include a driving tour of the wedding party and guest shuttle routes, the Naval Academy Yard and a walk through of the Naval Academy Chapel. If available, clients may also see a real wedding. On the "Day Of" the wedding what happens at the Chapel? The USNA Chaplain's Center provides several key people to ensure that weddings adhere to the time schedule and run smoothly. The Hostesses are the "Timekeepers" and prior to the ceremony they instruct the ushers and line up the bridal party for the processional. After the recessional, they prepare the Chapel for the next wedding and the process begins again. What is the Military Wedding Consultant's role at the Chapel on the "Day Of"? Can my guests park at the Naval Academy Chapel? ​The United States Naval Academy is a military base and visitors without a DoD issued ID card or vehicle sticker are not permitted to drive onto the Academy Yard. Each wedding can request up to ten (10) vehicle passes for their wedding party and guests. Everyone else must park outside the Naval Academy Yard and walk in through the pedestrian gates. Where can guests park outside the Academy Yard? ​Street parking in Annapolis is extremely restricted and guests who drive are advised to park in a downtown parking garage. Depending on the garage location and parking availability, guests could have a lengthy walk to the Chapel. As a courtesy to their guests, many couples provide shuttle service from hotels or garage locations directly to the Chapel. How can my fiancé and I plan a Naval Academy wedding when we don't live in Maryland? ​Couples working with Going to the Chapel... find that most, if not all, of the planning can be done by email or phone. Clients visiting Annapolis are provided with a printed itinerary, and a guided driving and walking tour of the Naval Academy Yard, the historic district, and reception venues. How do I find reputable wedding vendors and venues that meet my needs and budget? ​Going to the Chapel... has an established network of the top vendors and venues in Annapolis. All of our referrals are based on first-hand experience and we don't recommend anyone we would not use ourselves. In addition, we fully support veteran and USNA Alumni owned businesses. Where can I find information on uniforms, invitation wording, military titles and drawings of the Chapel? Going to the Chapel... provides all of their clients with written guidelines on wearing the correct uniform, invitation wording, military etiquette and service titles. Clients can submit their text for review and will receive an edited copy back with recommended wording. For drawings of the Chapel, Naval Academy, Annapolis or the Navy and Marine Corps insignia we are linked-in to the designer who holds the copyrights to those images. Going to the Chapel… is an independent consultant providing services for a fee, not an employee of the United States Naval Academy or the United States Naval Academy Chapel or its employees. Goint to the Chapel is an APPROVED BUSINESS PARTNER with Naval Academy Business Services Division.